Competition between Spain and Britain made Florida a haven for colonial South Carolina’s fugitive slaves in the 18th century. To destabilize British colonization in the north, Spain encouraged British slaves to escape to Florida, where they could convert to Catholicism and become Spanish citizens. In the 1730s, a black Spanish community formed in St. Augustine, the capital of Spanish Florida, and founded a town called Fort Mose. In the 18th century, two Fort Mose sites existed, one that the Spanish occupied between 1737 and 1740, and another occupied between 1752 and 1763. Fort Mose is the only known free black town in the present-day southern United States that a European colonial government sponsored. The Fort Mose Site, today a National Historic Landmark, is the location of the second Fort Mose. Slavery in Spain predated its colonization of the Americas. Spain established its slave laws in the 13th century. Catholic doctrine, Roman law, and Spanish policy influenced these laws. According to Spanish law, slavery was not a natural state for any race. It was a product of war by which the victors enslaved rather than killed their enemy. Slavery existed in Spain, but slaves had legal rights within the Spanish slave system, including the right to own property, sue in courts, keep their families together, and purchase their freedom. Black African slaves arrived in the Spanish colonies in the early 16th century, where they replaced the forced labor of the indigenous population. Enslaved Africans first set foot in St. Augustine at its founding in 1565 as members of Pedro Menéndez de Avilés’s colonizing expedition. Despite slave rebellions in the Spanish American colonies, by the 18th century, Spanish Florida had a growing population of both free and enslaved black colonists. Spain’s flexible attitude toward slaves and black freedmen encouraged British slaves in South Carolina to escape to Florida. In 1693, King Charles II of Spain ordered his Florida colonists to give runaway slaves from British colonies freedom and protection if they converted to Catholicism and agreed to serve Spain. The fugitive slaves from South Carolina who made it to Spanish Florida could expect to gain more control over their own lives, even as Spanish slaves. Between the late 17th and the mid-18th centuries, an unknown number of slaves from South Carolina successfully escaped to Florida. Spanish records note at least six separate groups of slaves who escaped from South Carolina to St. Augustine between 1688 and 1725. This policy of refuge encouraged fugitive slaves to flee to Spanish Florida with the hope of a better life if they made it to a Spanish outpost, and it gave the Spanish a weapon to use against the British. Spain’s policy toward runaways took laborers from the British colony and boosted its own colonial population to oppose the British. 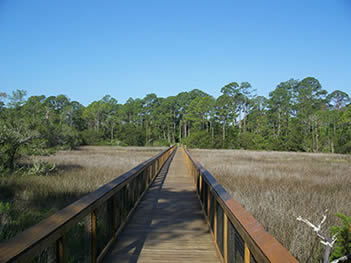 From this boardwalk, visitors can look across the marshy landscape where the ruins of Fort Mose Site lay. 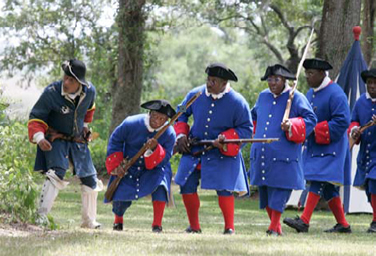 In 1726, Florida governor Antonio de Benavides created a black slave militia to help the white Spanish regiments defend St. Augustine from British attacks. He appointed Francisco Menéndez to lead the militia. Captain Menéndez was a black slave and a veteran of the Yamasee War of 1715. He escaped to St. Augustine from South Carolina with nine other slaves in 1724. Despite Spain’s promise of freedom, Governor Benavides ignored the broad view of King Charles II’s 1693 order to free fugitive slaves. He believed it only applied to slaves who arrived in Florida during wartime. Benavides, perhaps afraid of British retribution, sold several runaway slaves in 1729 to reimburse their British owners and did not free the militiamen, including Menéndez, despite their loyalty. In 1733, the government in Spain outlawed the sale of runaway slaves to private citizens and offered the soldiers freedom after four additional years of service. Menéndez and several others petitioned the government for freedom that year and in 1737 they received unconditional freedom from the new Florida governor, Manuel de Montiano. After Montiano granted freedom to Menéndez, he established the village of Gracia Real de Santa Teresa de Mosé for black citizens of St. Augustine. The appellation “Gracia Real” indicated that the king established the town. Saint Teresa de Avilés was the town’s patron saint, and Mose was the name of the site prior to settlement. Fort Mose was its unofficial name. There were nearly 40 free men and women at Fort Mose, including Menéndez and his wife María, who pledged to serve Spain and convert to Catholicism. According to British accounts, the first fort built was of stone and the community lived in dwellings outside of it. Although a white Catholic priest and a white Spanish officer were at the village, the governor considered Menéndez the head of the Fort Mose community and respected his military leadership. The Spanish government emphasized its religious and humanitarian reasons for founding Fort Mose, but the village was also strategically placed to defend St. Augustine against British attacks. In 1739, African slaves in South Carolina killed over 20 British colonists and then tried but failed to escape to St. Augustine in a revolt called the Stono Rebellion. After the rebellion, an international war in Europe intensified competition between the colonies and their uneasy peace broke down. In 1740, colonial governor James Oglethorpe of Georgia invaded Florida and burned Spanish outposts along the St. Johns River, as he led his force of British colonists and American Indian allies south to St. Augustine. They attacked the Florida capital and quickly captured Fort Mose. Because they lacked the fortifications to hold off Oglethorpe’s army, the Fort Mose community evacuated the town before the British arrived and escaped to St. Augustine. Soon afterward, the Fort Mose militia returned to take back their village from the British and won a conflict called the Battle of Bloody Mose. Beaten and unable to take the city, Oglethorpe retreated. The governor praised the bravery of Menéndez and his militia in a report of the battle to the king. After Oglethorpe’s attack, the Spanish abandoned the first Fort Mose and the black community returned to St. Augustine, where they integrated into mainstream Spanish colonial life. Reenactors at Fort Mose Site State Historic Park portray black regimentals in the Battle of Bloody Mose. Despite their successes in the capital, in 1752 Governor Fulgencio García de Solís ordered the black St. Augustine citizens to rebuild Fort Mose at a new site north of the city. The second Fort Mose, which Captain Menéndez again led, lasted until Spain gave Florida to Britain in 1763. In 1759, 67 people lived at Fort Mose. Most households were married couples and children. After the North American Seven Years War, known by the British as the French and Indian War, Spain abandoned Florida. The Spanish, including the Fort Mose community, left the continent and resettled in Matanzas, Cuba, on the Spanish frontier. Although the Spanish government outfitted them and gave them land, the Fort Mose refuges found life in Matanzas was rough. Refugees, including Francisco Menéndez, eventually moved to Havana, Cuba. The black Spanish community never returned to Fort Mose, but there is evidence of Spanish activity at Fort Mose after the American Revolution when Spain resettled Florida. Beginning in the 1970s, ongoing archeological excavations at the site of the second Fort Mose uncovered a moat, log stockade, and earthwork fort walls. Evidence within the earthwork walls dates structures back to the first Spanish occupation. In 1759, according to a Spanish census, Fort Mose had 22 dwellings. Archeologists believe they were located in and around the main fort. The second Fort Mose also had a large wooden parish church with a thatched roof. At the site, archeologists discovered beads, nails, glass, buttons, American Indian ceramics, Mexican majolica, English wares, and food remains. During the Spanish colonial period, the Fort Mose site was dry farmland. 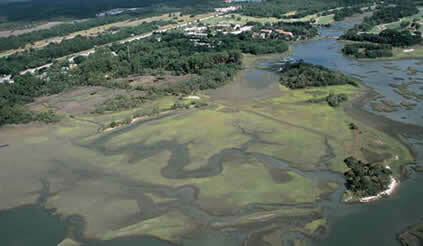 It evolved into a marsh during the late 19th century. The site today is Florida’s Fort Mose Historic State Park, where reenactors and rangers interpret the lives of Spanish Florida’s freed men and women. The visitor center provides information about the history of the site and its museum exhibit highlights artifacts from the Spanish colonial period. Beyond the museum, visitors can walk across a wooden boardwalk that extends from the public parking lot into the open marshland to see the site of the second Fort Mose. Fort Mose Site, a National Historic Landmark, is located at 15 Fort Mose Trail in St. Augustine, FL. Fort Mose Historic State Park is open Thursday-Monday from 8:00am to sundown and the visitor center is open from 9:00am to 5:00pm. For more information, visit the Fort Mose Historic State Park website or call 904-823-2232. Fort Mose Site is also featured in the National Park Service Aboard the Underground Railroad Travel Itinerary.